Create & Decorate is on Facebook! Join our group! We’re always sharing ideas and having giveaways… so come on… join in! Sure wished that I could have packed up more of my craft supplies to work on while waiting for our house to be completed! 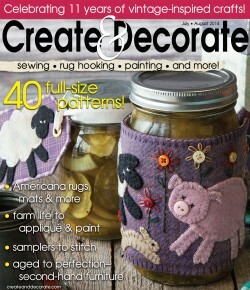 Lots of great projects to try in this month’s issue. This is the bestest magazine out there. It offers such variety and meets everyone”s hobbies.